Just when we packed up and set out for a couple of days of camping to get a break, the glorious summer weather changed. It seemed that the sun was hiding behind clouds and the temperatures dropped. The two nights in the camper were a sharp reminder that fall and winter will be here soon enough. It didn’t deter us from enjoying our time away. The first night was spent at Sylvan Valley Campground near St. Victor. 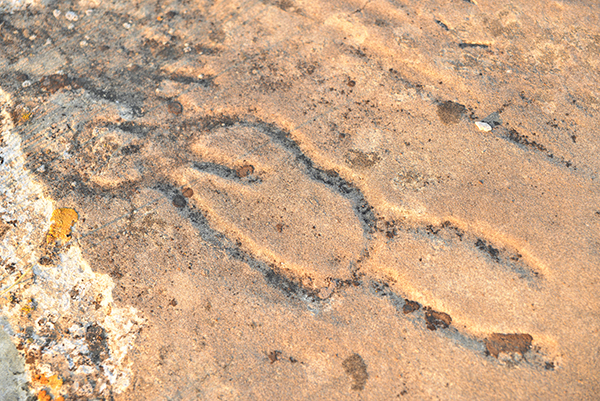 The ancient petroglyphs were just across the road and a personal guided tour at sunset was a wonderful end to the day. 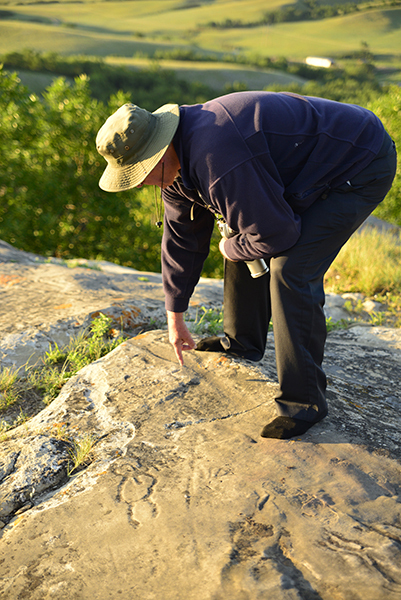 David Munro, our guide from “The Friends of St. Victor Petroglyphs,” actively interpreted the various markings on the sandstone slab. A close up of the ancient carving of a figure. The sandstone is covered with lichen. A dollar sized orange colored lichen takes approximately 1,000 years to form. The individual markings made by numerous Aboriginal tribes remains a mystery of how old these petroglyphs really are. Possibly the most famous person associated with Willow Bunch was Édouard Beaupré (1881 – 1904). He was born into this small prairie town and wanted nothing more than to be a cowboy, but he soon grew too big to ride a horse. 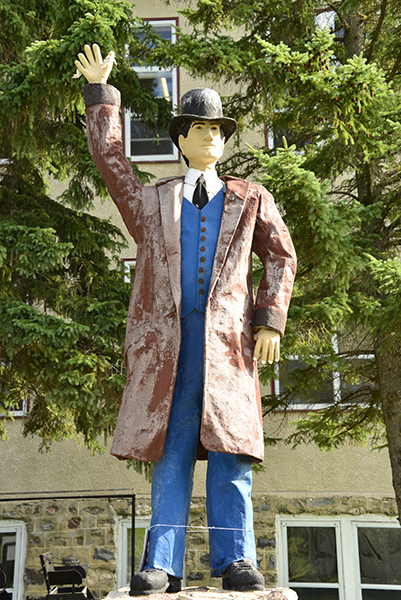 When the Willow Bunch giant died at St. Louis, Missouri in 1904, he had reached a height of 8’3” and weighed approximately 375 pounds. An autopsy revealed a tumor on his pituitary gland which had caused his phenomenal growth. His mummified remains were stored at McGill University in Montreal. 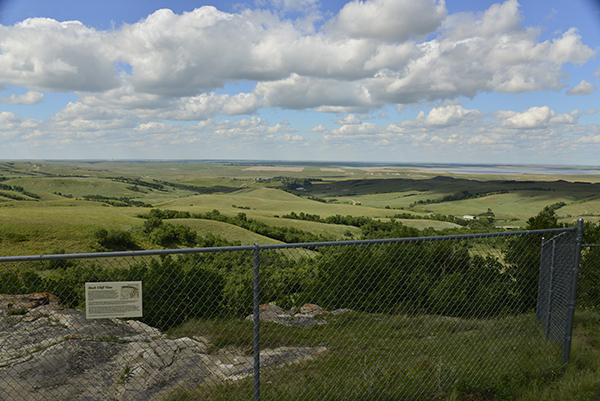 In 1990 the remains were cremated and interred on the grounds of the Willow Bunch Museum. 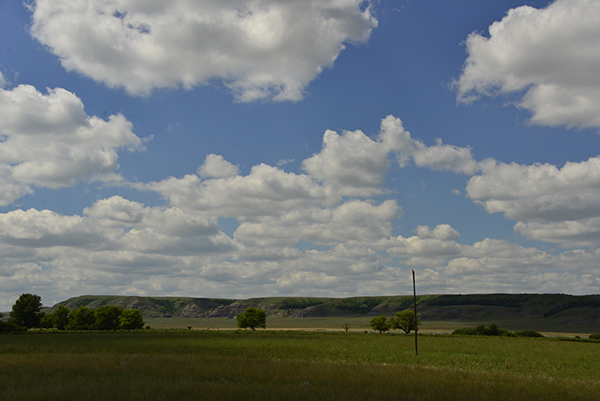 …before we carried on to explore the Big Muddy, Saskatchewan’s Badlands. Shaped by the last ice age this deeply carved valley holds a rich history for Aboriginals, early European settlers and outlaws alike. Entering the valley one is transported into a wild west movie landscape I so enjoyed as a youth. 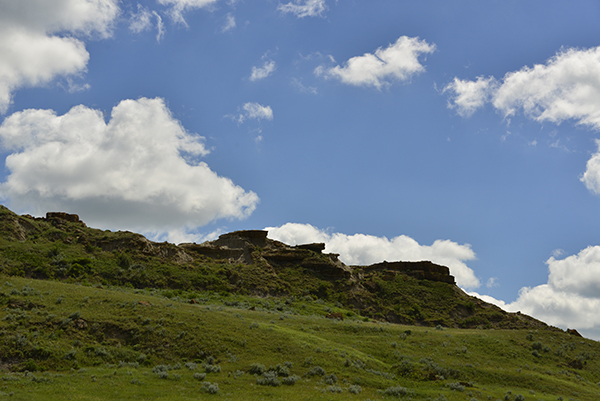 We followed the signs to Castle Butte from the highway. 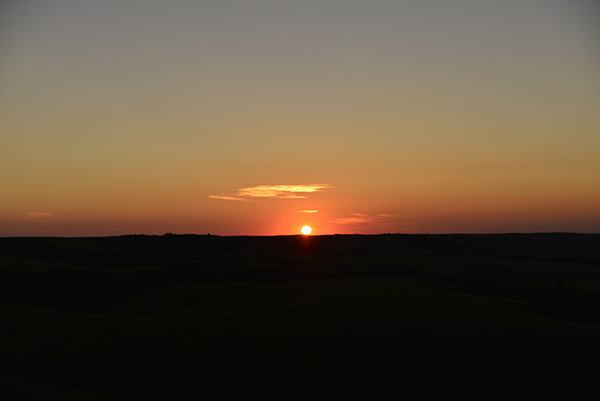 This was the first view that welcomed us into the vast valley that is home to several ranches. Above, the view to the “other side” of the valley. Herds of cattle grazed along the roads. After six kilometers of gravel road our destination rose in the distance. 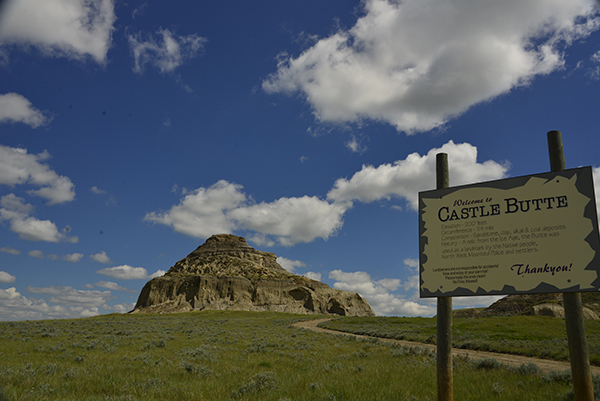 Castle Butte, an ancient natural monument was used by Aboriginal people and the Royal Mounted Police as a major landmark throughout early times. Today it is a popular tourist destination. We set up the camper and decided to spend the night to witness the good light for some great photos. With many hours to go we were able to watch visitors come and go, climb sections of the wall, explore the caves and walk/climb the peak. I tried to tackle my fear of heights, packed my camera in my back pack and set out to walk up the steep, narrow path… Let it suffice to say, I made it up the first third of the near vertical path. When it forked I had a brief reality check – it would be one way to make it up to the top, quite another to come back down… The decision was easy – I turned around! No regrets – lost photo opportunity but I know myself and mountain tops…. 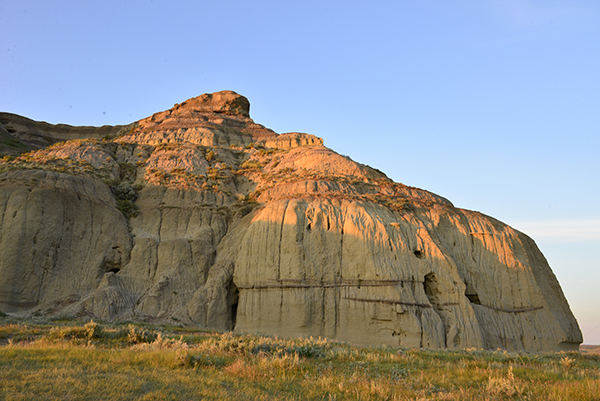 One last image of Castle Butte during sunset – 200′ of climbing pleasure for those who love heights. 29 Jul	This entry was published on July 29, 2013 at 10:28 am. 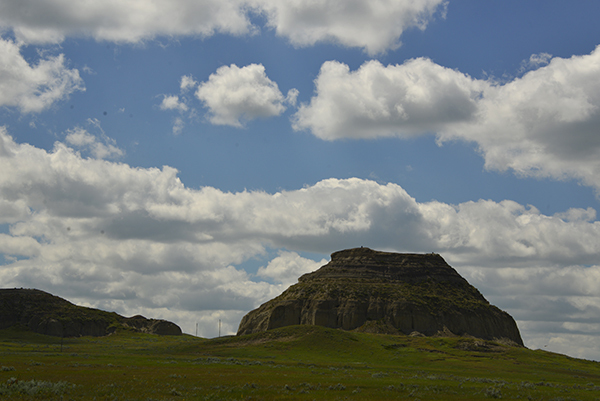 It’s filed under Art, Creativity Update, History, Journaling, Landscape photography, Nature photography, Travel and tagged Big Muddy Badlands, Castle Butte, Saskatchewan, St. Victor Petroglyphs, The Friends of St. Victor Petroglyphs. Bookmark the permalink. Follow any comments here with the RSS feed for this post. Wise maybe – fear of heights was more like it, Linda!